Sponsor an Acre at the Boston Visitor Center Today! Sponsor an acre or give one as a gift to a friend or family member. Your donation will allow the Conservancy to help preserve, protect, and enhance CVNP. Membership in the Conservancy (which includes a membership card, the park’s Schedule of Events mailed to your home, and discounts at Trail Mix stores, concerts and events, Stanford House rentals, and more). A certificate of acre sponsorship. Affirming that you place a high value on the park and the benefits it provides you. 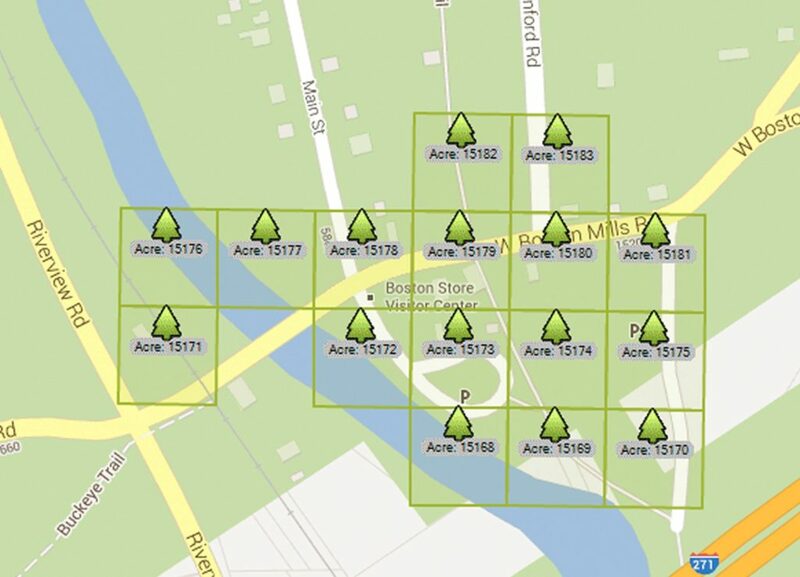 Select an acre from the map and record the acre number in the donation form below. Questions? Call us at 330-657-2909 ext. 139. Give $45 or more and enjoy valuable benefits. Plus, when you donate by August 31, your gift will be doubled. Explore Cuyahoga Valley National park! Have you joined our email list yet? We promise to share unique insider park information and updates on fun events. Plus, when you join, we’ll send you a driving tour of the park.